Volume data is a 3-dimensional array of numbers. 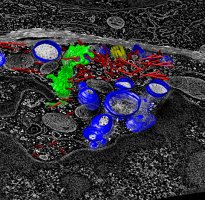 Chimera volume tools were created primarily for looking at electron microscopy (EM) maps. 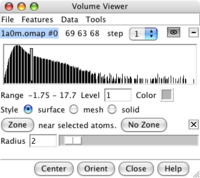 All volume tools work on any volume data, but are most useful for objects seen in EM maps. Today's demonstration will use mostly x-ray maps since most participants study systems at that resolution. 1 hour demonstration, followed by 1 hour of selected self-guided exercises and individual consultation. This is an introduction. A thorough knowledge of Chimera volume capabilities would take about 10-20 hours of study. Follow along with demonstration on your computer if you wish. 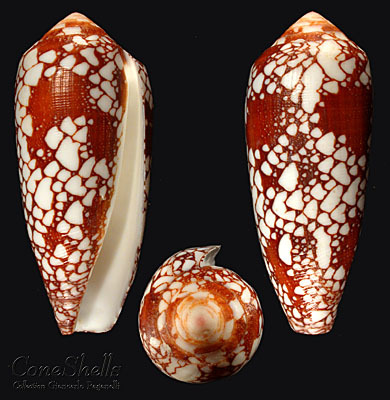 Open 1a0m.omap x-ray density map for 1a0m, a neuro-toxin from a snail, Conus episcopatus. Chimera reads 22 map file formats. Show volume dialog File / Open..., File type menu. 1a0m is in the format used by the x-ray model building program O.
Histogram of data values with logarithmic bar heights. Bars look like comb teeth because O format uses single byte data values, 256 discrete levels. Data values range from -1.75 to 17.7. 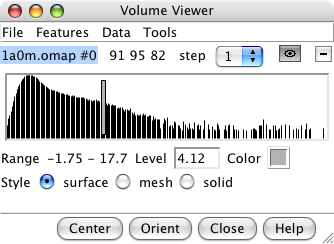 Vertical marker on histogram shows contour level for displayed surface. Move level to large value (e.g. 10) shown in entry field. Surface encloses all data values larger than the contour level, so surface is small when using a high contour level. Shows just pairs of balls representing sulfurs in disulfide bridges. 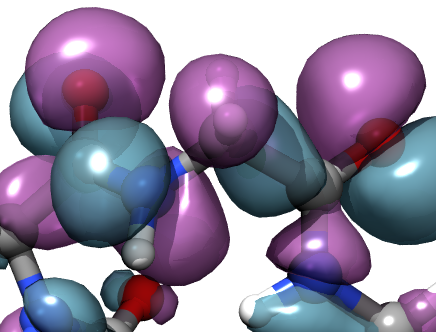 This alpha-conotoxin has 2 disulfide bridges and parts of several copies of the protein are seen in this crystal map. At a low contour level (e.g. -0.5) surface encloses almost entire box of data. Shows bounds of data set. Use volume dialog Tools / Volume mean, SD, RMS. Reports mean = -0.03796, SD = 1.0007, RMS = 1.0014. Approximately mean = 0, SD = RMS = 1. Not exactly because O map file format uses only 256 discrete values and normalization probably based on higher precision floating point map. SD is standard deviation = root mean square deviation from mean value. RMS is root mean square deviation from zero. 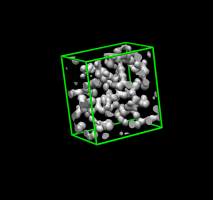 Electron microscopy density maps are usually not normalized (e.g. mean = 370.51, SD = 1477.11), scale is not meaningful. 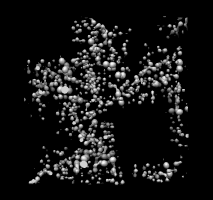 Why negative density in x-ray map? Supposed to be density of electrons -- should be non-negative. Don't know. 1.5 sigma contour level means data value 1.5 since SD = 1. Set contour level to 1.0. 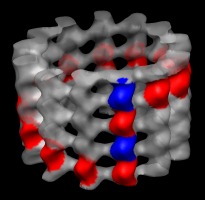 The conotoxin protein is packed in the crystal. 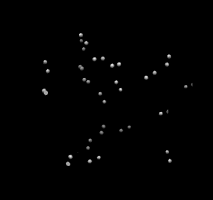 Individual atoms and residues can be seen in the density, high resolution 1.1 Angstroms. Color a connected piece of surface to see one copy of protein. Volume dialog Tools / Measure and Color Blobs. 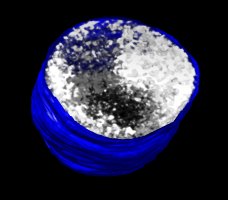 Ctrl-button-3 on central blob to color protein. 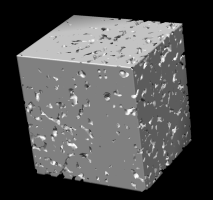 Volume enclosed by surface (cubic Angstroms) and surface area reported. Change color and click on a different blob. Connected pieces of surface are colored. Usually this will not work to pick objects out of maps because the surfaces for separate objects are often joined. Want an unobstructed view of one copy of protein. Another approach: clipping. Menu Favorites / Side View shows map from side. Yellow square represents your eye. Move vertical yellow lines to hide surface in front and back of those lines (clip planes). Where plane cuts through pink blob it makes holes in the surface. Hard to see because surface is pink on inside. Cover holes in surface using Tools / Depiction / Surface Capping. Click "cap surfaces..." to turn on. 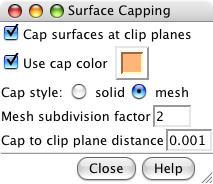 To make caps more visible, try different cap color, or mesh caps, try subdivision 2. Front and back clip planes remain parallel to screen as map is rotated. A different pair of clip planes is fixed to the map. Move front/back clip planes to show entire map. One way is to use menu entry Actions / Focus. Tools / Depiction / Per-model clipping, then click Enable Clipping. Rotate map and clip plane stays fixed to map. 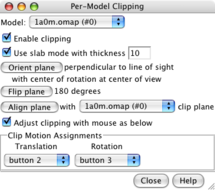 To move clip plane click "Adjust clipping with mouse" in Per-Model Clipping dialog. Use mouse buttons 2 and 3 to move and rotate plane. To clip the back also, turn on "Use slab mode..." and adjust separation between planes (thickness) to 10.0. Volume dialog Features / Region Bounds. Map size is 91 by 95 by 82 data planes. Grid point indexes start at 0. Region bound for x shows mininum 0, maximum 90, step 1. For large data sets display may be slow and using step 2 to display every other data plane will speed it up. Use step menu at top of volume dialog. Try step 2, compare to step 1. Coloring disappears. It is not remembered when surface changes shape. Adjust x range to be 20 to 50, step 1, pressing Enter after typing the new values. You can draw a subregion with the mouse. Use volume dialog Features / Subregion Selection and click the "Select subregions..." button. Drag a box with the mouse while holding down button 2. Press the Crop button to show only the region within the box. Move the box faces by dragging with button 2 and press Crop to show a new region. Another approach to getting an unobstructed view is to use an atomic model fit into the map. Open 1a0m.pdb. Use Presets / Interactive 2 (all atoms) to color it. Turn off "Select subregions..." in volume dialog and close subregion panels with "x" buttons in right corner of panel. Hide map with eye icon to right of step menu. Menu Select / Chain / A. Note there are 3 chains A, B, water. To show map just near the selected chain A reshow map with eye icon and use volume dialog Features / Zone and press Zone button. Press the Mesh button on the volume dialog to be able to see through the map surface. Use menu entry Actions / Atoms+Bonds / Show Only to hide the other chains. We can look at the fit of residues in the map. 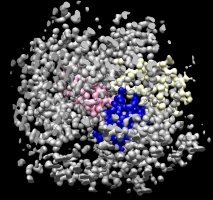 Chimera is not used to build models in x-ray maps but has limited molecule editting capabilities. 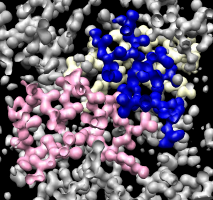 Serine 4 of chain A has two density lobes because it occurs in two different positions. We'll start with the main position and adjust the model to the secondary position. 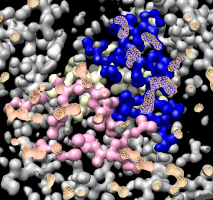 Show the PDB model in stick style using Actions / Atoms+Bonds / Stick. 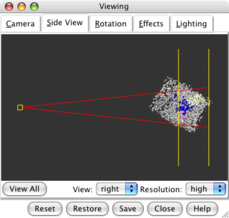 Select serine 4, Favorites / Command Line, "select :4.A", zoom to show it, "focus sel", and show the volume zone just around it by pressing Zone. 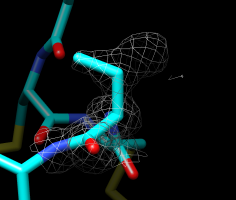 The PDB model contains both positions. We'll delete the second one "del @.B" (delete alternate atom positions labeled B). 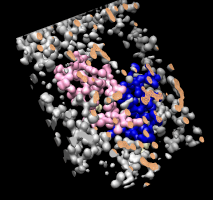 To show common residue orientations use Tools / Structure Editing / Rotamers and press OK to show serine rotamers. 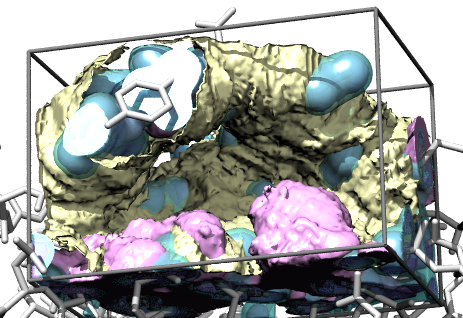 Use Columns / Add / Density... and press Ok to see the sum of side chain atom density values for each orientation. 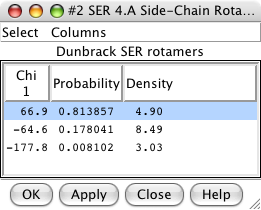 Select the second highest density (4.90) line and press Apply to change the serine orientation. Now we'll look at which atoms lie in low density. Select all atoms (ctrl click one, then press up arrow twice), show all atoms (Actions / Atoms+Bonds / Show), press Zone. Most atoms lie within the 1 sigma contour surface. Calculate the density value (interpolated) at each atom position using volume dialog Tools / Values at Atom Positions and press Histogram. 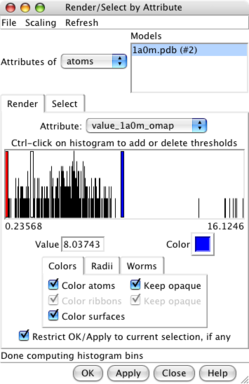 The histogram shows the density values at the atom postions ranging from 0.235 to 16.1. Move color bars on histogram and press Apply to color the atoms, red at 0.2 sigma, white at 2 sigma, blue at 8 sigma. Make the density mesh transparent by pressing the color button on the volume dialog, press the Opacity button on the color editor and set opacity to 0.5. Use the Select tab of the Render by Attribute dialog to select just those atoms with density below 1.5 sigma. 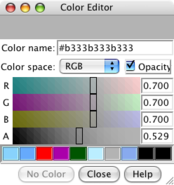 Choose attribute value_1a0m_omap, adjust the green bars to positions 0.2 and 1.5 and press Apply. 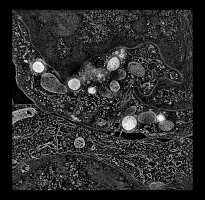 We'll look at a few tools useful with lower resolution electron microscopy maps. 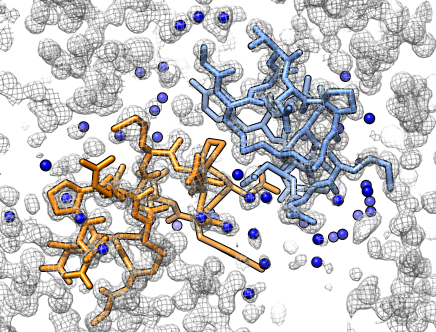 First we look at fitting an atomic model of tubulin into a microtubule. 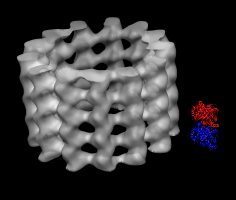 The microtubule is built from 13 subfilaments, each consisting of alternating alpha and beta tubulin protein monomers. Close the current session, File / Close Session. 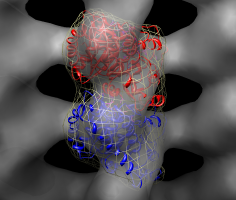 Open microtubule map microtubule.mrc and tubulin dimer 1jff.pdb. 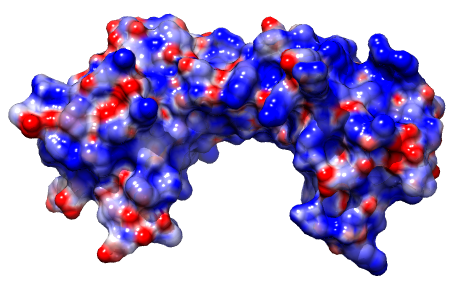 Use Presets / Interactive #1 (ribbons) to show alpha and beta tubulin chains as blue and red ribbons. 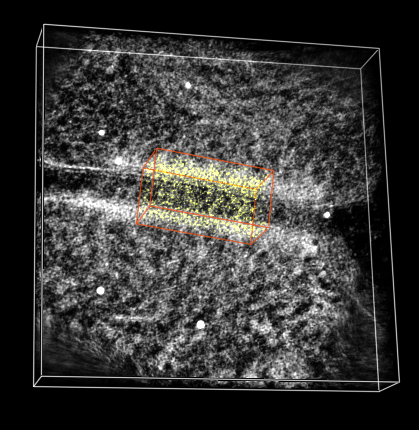 Lower microtubule contour level (~140) and make transparent, use region bounds to show z planes from 30 to 80 for faster display, set step 1. 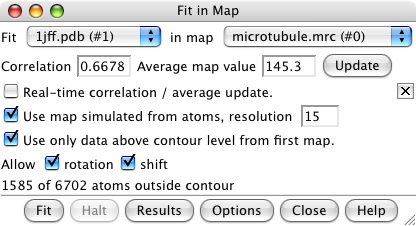 Use Favorites / Model Panel to deactivate map and move PDB away from map so we can show how to place it in the map. 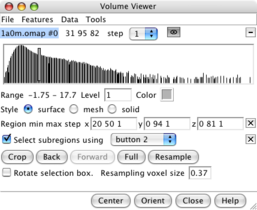 Use volume dialog Tools / Fit in Map to optimize the fit. First hand place 1jff approximately where you want it, choose 1jff.pdb in the Fit in Map dialog, and press Fit. This does a local optimization of the orientation and position to maximize the average density at the atom values. Different initial orientations (180 rotation about tubule axis, or flip alpha and beta) will produce different average map values: 145.3 (best), 143, 144.1. Goodness of fit is usually reported as a correlation value. To get this press the Fit in Map Options button, click "Use map simulated from atoms" with a resolution of 15 (Angstroms), then press Fit. Correlation ~0.6. Microtubule map and tubulin dimer. 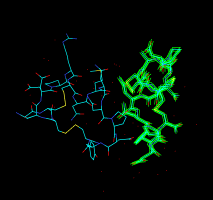 Fit tubulin including simulated map. 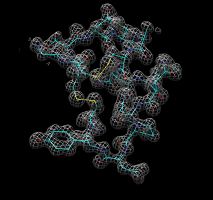 Now we'll look at the arrangement of tubulin monomers and color the map to show this. Close 1jff and the simulated map using Model Panel. 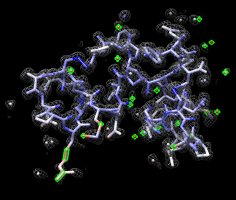 First we'll place markers (spheres) for each tubulin monomer in the map. 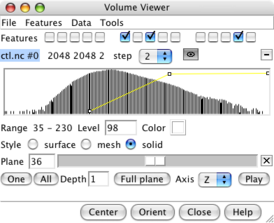 Use volume dialog Tools / Volume Tracer. Place a marker by clicking on the map with the middle mouse button. Change the color to red and radius to 10 (Angstroms). Place a second marker. Delete the undesired connection between them with tracer dialog Actions / Delete Link and turn off Mouse / Link New Marker to avoid producing more links. 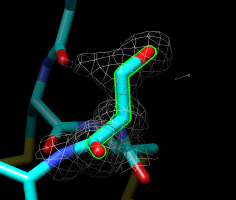 Mark a lengthwise filament and a helical turn, and alternate the colors on the lengthwise filament to represent alpha and beta tubulin subunits. 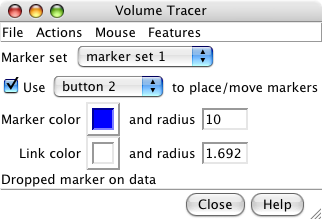 The coloring can be done at the end by hiding the map, selecting the markers to color blue (shift ctrl click to add to selection) then pressing the marker color button on the volume tracer dialog. Note that the helical turn of red markers runs into a blue marker after one complete turn. 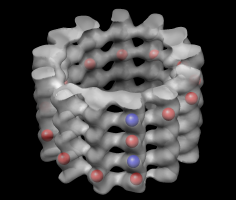 The microtubule has a seam between two of the subfilaments where alpha tubulin touches beta tubulin instead of alpha-alpha and beta-beta. To color the map directly uses volume dialog Tools / Color Zone, select all markers (Select / Select All), press Color and set radius to 25. Hide the markers with tracer dialog Actions / Hide markers. 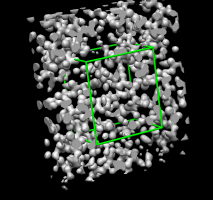 We'll take a brief look at lower resolution data, electron tomography of a cytotoxic T-cell. Open ctl.nc. 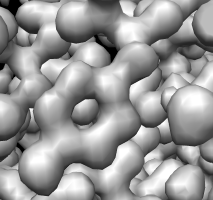 Large volume data such as this will initially only display a single plane (middle z-section) in gray-scale rendering (solid style). The volume dialog will show a plane slider (Features / Planes) that controls which plane is displayed. To speed up display when flipping through planes a subregion of the plane can be selected as shown earlier. Chimera could be used to trace objects in this T-cell map but a different program IMOD is better at it. Here we'll import tracing done in IMOD. Open ctl.imod. We can extract the part of the map in one of the blue vesicles by selecting it and using the Chimera "mask" command. 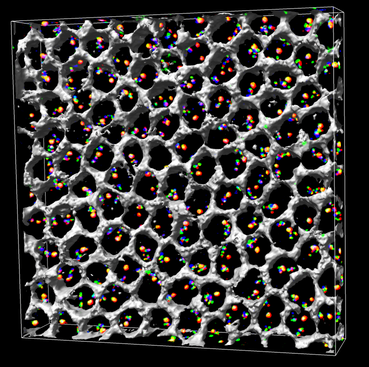 All the vesicles are treated as one surface. To split them into separate surfaces select them and use keyboard shortcut "Sc". Keyboard shortcuts are enabled with Tools / General Controls / Keyboard Shortcuts. Select just one vesicle surface and use the command "mask #0 sel" to obtain a separate volume data set containing just the data within the vesicle surface. Keyboard shorcuts invert selection "is" and hide surface "hs" can be used to hide the other traced objects.